On November 23, the Icelanders of Victoria club showed the Icelandic film, Árásin á Góðafoss. 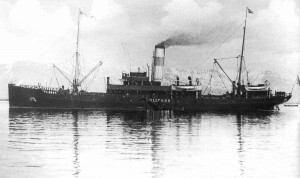 The Góðafoss was an Eimskip ship that was torpedoed and sunk during 1944 by a German Uboat. If Western Icelanders want to understand their Icelandic cousins, they need to know historical events like these. Although, only twenty-four people were killed in the attack, it is important to remember that Iceland’s population at the time was around 120,000. Because of the small population, nearly everyone in Iceland was related . The loss was a shock to the entire nation. 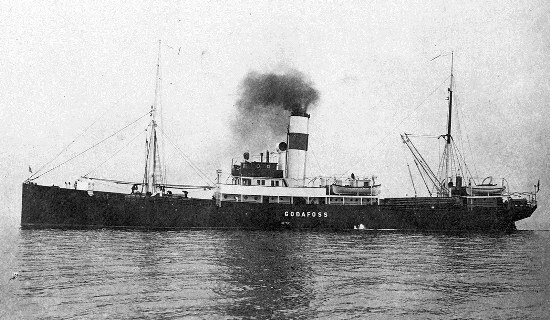 The Góðafoss was a cargo and passenger ship. Iceland, in spite its occupation by Allied forces–British, Canadian and American–was neutral. It had no army, navy or air force. It had declared war on no one. Once the occupation took place, in spite of assurances from the military, control of Icelandic affairs was largely by the occupiers. There was no need for them to point a gun, or drop a bomb. Along with having no way of defending its territorial integrity, Iceland was dependent on imports of oil and coal. Without oil the fishing fleet could not have operated. Without coal, the Icelanders would have suffered from the cold. They were no longer living in huts made of turf and lava. Geothermal energy was not yet fully developed. They were also heavily dependent on imports for other necessities. Their only market for their fish was England. The Góðafoss was described as a steam merchant of one thousand, five hundred and forty-two tons. It was build in nineteen twenty one. The owner was Eimskipafélag Islands. Western Icelanders had a particular interest in the Eimskip ships, not just because family and friends owned them and worked on them but because money had been raised in Canada and the USA to help establish the company. The ship was carrying forty-four people plus survivors from an oil tanker that had been torpedoed. It was also carrying twelve hundred and forty tons of cargo. It had traveled with a convoy from New York to Loch Ewe, Scotland. From there, it led a convoy toward Iceland. 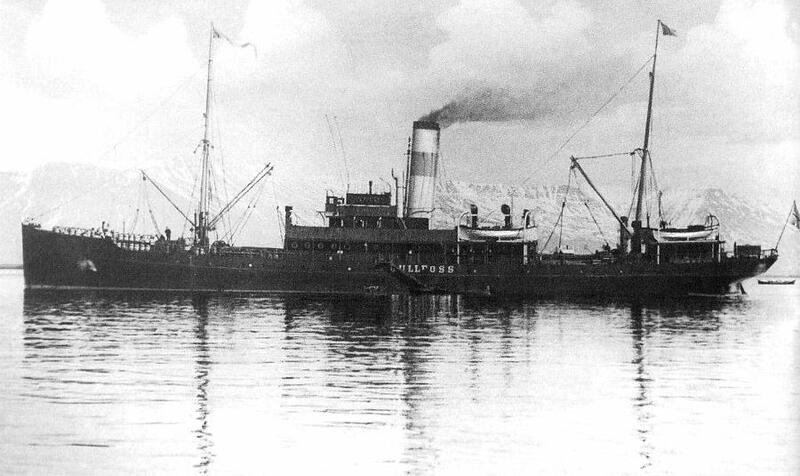 Bad weather caused the convoy to break up and, after holding its place during the night, the Góðafoss and the oil tanker Shirvan continued toward Reykjavik. First, the Shirvan was torpedoed. It exploded and its cargo caught on fire. The captain of Góðafoss, Sigurður Gíslason, ignored standard military orders to ignore survivors. He stopped to pick up the sailors from the tanker. 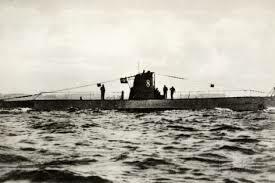 This gave the German submarine captain, Fritz Hein, of U-300 an opportunity to attack the Góðafoss.After the torpedo struck, it only took seven minutes for the Góðafoss to sink. During those seven minutes, there were attempts to get lifeboats and rafts into the water. However, because of the explosion, it was only with great difficulty that two lifeboats and one raft were released. One lifeboat that fell into the water was upside down. Although there were many people in the sea, the navy made no attempt to rescue them. They even set off depth charges close to them that may have killed some of those who had survived the sinking. An interesting note in the film was that the twenty-three year old submarine captain was ordered back to his base where he faced a court martial for sinking a ship from a neutral country. He was absolved of the charge because the Góðafoss was traveling in a military convoy and so was partially responsible for its fate. The movie is in two parts, the first ending with the sinking of the Góðafoss. The second part is mostly interviews with survivors, including two German sailors who talked about their role in the sinking. One said that he was only seventeen when he joined the German submarine corp. The first part of the movie is put together with Icelandic, Allied and German historical clips, with sections on the search for the wreck of the Góðafoss linking them . The film does an excellent job of showing something of what life was like in Reykjavik during the war. There is also a good depiction of what life was like for German submariners. The second half of the film grips the heartstrings for it shows the outcomes for various people aboard the Góðafoss. There is the terrible fate of the people who survived the explosion and clung to the overturned lifeboat until they lost consciousness and slipped into the ocean. The two women who were still on the hull when it was bumped during the rescue effort and one of them was knocked into the water and disappeared. Such deaths are always tragic but the most tragic story of all has to be that of Dr. Sigrún Briem and her husband Dr. Friðgeir Ólason. They were returning to Iceland with their three childrenÆ Óli, 7, Sverrir, 2, and a baby, Sigrún. Sigrún and Friðgeir were returning to Iceland after completing their medical studies at Harvard. All were lost. Ellen Ingibjörg Wagle Downey had married an American serviceman and was returning to Iceland with her three year old son, William. They both died. Ellen´s husband was fighting at the Battle of the Bulge but received permission to go to Iceland to be with Ellen´s family for a short time. There were survivors. Somehow, miraculously, among the wreckage, some lived. One was Áslaug Sigurðardóttir. She is among those interviewed. The story of the master of the ship, Sigurður Gislason, he who stood on the deck as the ship sank but was cast up by the rushing water instead of being drawn down, is, in itself, fascinating. He is interviewed. And, finally, as it should, the film tells us the fate of the U-300 and its crew. No one wins in war. The armies destroy each other but what they destroy more is the civilian population. In working on a different article about Iceland in 1944, I came across a quote from an American senior officer who said to an Icelander something like, “You are very fortunate that we got here first because if the Germans had got here first, we’d have rooted them out without worrying about the people of Iceland.” It is a brutal but straightforward statement. Today, we see it in many parts of the world. The combatants war against each other but the greatest casualties are the innocent civilians. If your club hasn’t shown this film, ask for it to be shown. It’s nice to go around grunting like a Viking and all that with all the horror and tragedy washed away by time but if you really want to know about Iceland and Icelanders, it is more recent history that needs to be observed. The film has an English voice over when Icelanders and Germans are being interviewed. The June 17 celebration of Jon Sigurdsson day was fun. I’d been asked to participate in the evening’s entertainment so I first stopped at the Winnipeg Art Gallery to check the light on the podium and the sound of the mike. Microphones are all different and you have to know how you use the one provided. Got to meet Kevin Olafson who was organizing the Nuna show. I’d parked at the Bay parking lot. It is right across from the art gallery. Went into the Bay because when I was a child and into my teens, going to the Bay was a big deal. It was in the basement you could get a malt and hot dog. Only in Iceland are pilsar as good as Bay hotdogs and they don’t have malts. The Bay was depressing. At one time, it was classy. Now, the floors have broken and missing tiles, there are large areas with no products. They need to do like Victoria, shut it down, turn the building into classy condominiums. I drifted down Portage, stopped at Don’s photography store and, after weeks of struggle, decided to buy a telephoto lens so I can take pictures of the Ospreys of Willow Island. The ospreys, I hate to admit, are smarter than me. Even when I wear camouflage, cover my hat with twigs and leaves, they know it is me. They wait until I’m just starting to get into camera range and then they fly to a tree in the marsh. I swear I can hear them laughing. The Eimskip executives appeared. We drained the dregs from our coffee cups and found our way out of the Legislative labyrinth to the Jon Sigurdsson statue. The Solskrikjan Choir, led by K. Wilson, was bravely contesting with the passing traffic. They looked dashing in their white and red. The loyalists were gathering, gradually filling up the rows of chairs. Consul General Hjálmar Hannesson introduced the guest speaker, Gylfi Sigfusson, the CEO of Eimskip. A lot of speeches by visiting dignitaries are yawners. However, Gylfi´s speech was interesting. I’m hoping, assuming, that it will be reproduced in LH. It gave a comprehensive history of the creation of the shipping line and its importance to Iceland’s struggle for independence. Gylfi emphasized the fact that it was Winnipeg Icelanders who provided twenty percent of the start up money for Eimskip. The speeches were neither too long , nor too short, the rain held off and when the official program was over, we all trooped to the Winnipeg Art Gallery. Bardal’s black bus was available for those who wanted to ride. I walked back to my car on the Hudson Bay parking lot and wolfed down a ham and cheese sandwich made with gluten free bread. A good sized crowd came to the gallery for the show. It was well worth their effort. Eimskip, because this is their 100th anniversary, has produced a film in two parts about the history of the company. We watched the first part. I was fascinated because it was made up of news clips taken in Reykjavik and New York close to the beginning of the 1900s. If you want to see the Reykjavik of your great grandparents and grandparents this is the film to watch. I hope that Eimskip makes the film available to all the Icelandic clubs and donates a copy to the Icelandic Library at the University of Manitoba. With the evening over, we went on to the vaudeville entertainment. Zach Allard accompanied himself on two songs, ‘New North –Side Air’ and ‘Ship and Anchor’. He was followed by a presentation that riveted my attention. Kathleen Hiley and Quincy Hiebert danced an excerpt from “Beating of Wings”, that had me sitting forward in my seat. As someone brought up on The Royal Winnipeg Ballet and a long time folk dancer, I was filled with admiration for the choreography by Gaile Petursson-Hiley and the marrying of the bodies of the dancers in a demanding, captivating routine. Time and again, I would like to have taken photographs but, of course, the light wasn’t right and I’d left my camera and new lens in the car. Victoria Sparks followed the dancers and treated us to a tune entitled “Rock Song” on keyboard and percussion, followed by “Bi Bi og Blaka”, an Icelandic Folk Song. Feeling that I would be boring after the singing, dancing, percussion, I launched into a description of the week in 1874 when, for the first time in its history, a Danish king came to Iceland. Christian IX was coming to present the Icelanders their new constitution. In any case, I see all this through a dark filter. When I went out to my car, the back driver’s side window had been smashed, my Sony A33 and two lenses, including the lens I had just bought that afternoon, had been stolen. The thief also stole the insulated bag and freezer pack my cousin Dilla had given me to keep my sandwich cool. I hope he was appropriately disappointed when he looked inside. Even with insurance, the loss for me will be around eight hundred dollars and, more importantly, the two memory chips had my month’s research photographs. Those can’t be retaken until next year. It was a cold, bitter ride back to Gimli but I was warmed by the events of the day. I wouldn’t let a petty thief steal that. On May 30th, 1917, Stephan G began his trip to Iceland. First from New York to Halifax and from there to Iceland. On board the Gullfoss, everyone treated him kindly and with respect. In Canada, there were some who had tried to have him charged with treason and put in prison because he disagreed with them about the slaughter in Europe. They saw glory in it. He saw nothing but tragedy and wasted lives. On the Gullfoss, people only wanted to honour him. Of course, one has to remember that the attitude of people in Iceland, a country that was a non-combatant, was different from that in Canada which, as a colony of England, had soldiers at the battlefront. In Canada, some Icelanders hoped that the participation of young Icelandic men in the war would help Icelandic immigrants gain an honorable place in Canadian society. On June 16, the ship arrived in the Reykjavik harbour. The invitation committee came onto the ship. A crowd gathered at the harbour to cheer Stephan. The next day was June 17th. There was a banquet that night with fine food and coffee. There were speeches, including one by Stephan. He was a guest of honour at Women’s Day. He gave another speech and poetic toast. According to Viðar, “Stephan took long walks with some of Iceland´s most prominent intellectuals and attended an endless round of receptions and parties.” He went sightseeing and even managed, in spite of prohibition, to find a drink or two. He traveled by boat along the coast, then by horseback. All this time, he was writing poetry. It was at this spot in Wakeful Nights that I had to pause in my reading, deeply touched by the Icelanders’ greeting to him. To understand the significance of what happens, you have to understand the importance of hay making and the precarious weather of Iceland. There is only one crop, hay. No grain will ripen. The hay must feed the milk cows and sheep for it is upon them that everyone’s life depends. In good weather, people will cut and rake hay for twenty-four hours a day. They work as if their lives depend on it and, in fact, their lives did depend on it. Stephan was escorted from farm to farm. He came to Iceland as a great poet but also as a farmer who had worked all his life to create a farm that would support his family and, as a farmer, he was interested in agriculture in Iceland. “Wherever Stephan went on this trip, he was greeted with flags, speeches, and song. At Ytra-Fjall in the valley of Aðaldalur he had a lively discussion with farmer-poet Indriði Þorkelsson….Indriði had been mowing hay with his sons. He stopped cutting unusually early, however, went inside, washed his hands, and put on a clean jacket.” He was going to meet Stephan. As he traveled about the country, he was greeted as a great poet in a country which revered poetry. There were those who refused to participate in this homecoming, but from what I read in Wakeful Nights, it was not religious conflict that kept them away but secular conflict, the distaste of the wealthy and privileged for a poet who writes of financial and social injustice. What else can one expect? If the poet writes about the exploitation of the ordinary person by the privileged why should the privileged cheer him? If Stephan were alive today, he would surely have been composing poems about the banksters and politicians responsible for the kreppa. One would hardly expect the objects of his scorn to honour him. As Winston Churchill said, “You have enemies? Good. That means you’ve stood up for something, sometime in y our life.” Stephan stood up for something all his life. I admire the Icelandic people because they honoured Stephan G in spite of the fact that he struggled all his life to be a good farmer yet never made much money. They honoured him for his poetry, for his talent, for his intelligence and for his bravery. Few of us are brave enough to stand up to those who are wealthy or hold positions of power. Then and now, those who are adept at making money, are quick to assume that having done so means that they are superior to others who have not done as well financially, and that their opinions on all things must also be superior. There is something about the making of money that feeds vanity. However, Icelanders were well acquainted with men like Björn of Leirur from Paradise Reclaimed. Björn had married for money, had become “an agent for the Scots, buying up ponies and sheep on their behalf for gold.” He was always ready to take advantage of anyone who had fallen on hard times. He used bribery and attached himself to important people. Paradise Reclaimed is a novel by Laxness, a fictional account of life around the time of emigration to North America, but it is also an accurate account of the behaviour of many of those who prospered while others, faced with a harsh climate, harsh Danish rule and harsh local laws, worked endlessly just to feed themselves and their families. Björn is part of a small, corrupt group of the priviliged class. It is people like these that the emigrants fled. The people who emigrated did so for an opportunity to own their own land, to have a chance to better themselves and their families. However, there were those who came with them who wanted to perpetuate the old system. Stephan, to his credit, did not write in praise of the wealthy in order to receive gifts or favours from them. There is no more dangerous person than the one who will stand up for his beliefs. Ask the Poles about Lech Walesa. Communism laid claim to represent the ordinary working class. It represented only the ruling class. To exploit others, you don’t have to be a capitalist. Every economic, religious, and social system contains within it, people who will use the system to benefit themselves at the expense of others. To them, the person who reveals what is being done is the enemy for such a person would incite others to take away privilege, distribute resources more fairly, and demand honesty. Today, more than ever, we need Stephan G, we need ten or a hundred or a thousand Stephan Gs, writing, speaking, publishing, broadcasting, investigating in the face of ever greater accumulation of wealth by the few and political and economic power by even fewer. Meeting Stephan, many people were surprised, taken aback, because they saw a small, weather worn farmer when they’d expected a giant. He was a giant, a giant of words. Like the people of Myvatn, we need to ride out to greet him, to honour him, to sing his praise, for it is of us and for us that he writes. I do not understand the religious conflicts in which Stephan participated in Canada. Wakeful Nights refers to them but does not discuss them. From the perspective of 2012, with the sharpest rate of membership decline being in the Evangelical Lutheran Church, with empty pews and few new clergy, the conflicts within the Lutheran church during the late 1800s and the early 1900s, seem strange, self-destructive, more about opinionated, self-righteous individuals and social class than about theology. Those conflicts have divided and weakened the church and driven away its members. That’s not to criticize any of those involved in the conflicts. To criticize, I’d have to have a historical understanding and know enough about religion at the time to draw a conclusion about who was and who wasn’t being reasonable. Religion is not based on reason but on faith and history so that makes it even more difficult to understand. It may be that to understand the religious conflicts referred to, one would have to have a companion volume describing the positions taken and the reasons for them. Would anyone actually read it? I doubt it. To me, the finest writing in Wakeful Nights is this section describing Stephan’s visit to Iceland. It describes Icelanders in a way that makes me proud of my Icelandic background. The people ride toward him and sing just as they rode to greet King Christian IX in 1874. Their action reveals not just the esteem in which they hold the author of Andvökur but also their values, values that do them honour. This is Iceland at its best. When I was editor of Logberg-Heimskringla, I had a number of people say, in one way or another, “I’m a proud Icelander.” Or “I’m proud of my Icelandic background.” When I asked them what they were proud of, they seldom could pin it down to something specific. Buy Wakeful Nights, read it, if you don’t read all of it, read the section describing Stephan G’s triumphant visit to Iceland. Imagine the landscape, the mountains, the glaciers, the rivers, the narrow trails. Imagine the people on the farms setting aside their scythes and rakes, mounting their horses and riding to meet the poet of the Rocky Mountains.